Embark on this half-day private morning walking tour to discover some of Tokyo’s cultural sites with a local guide. You will visit indispensable sightseeing spots in Tokyo. The sites you will visit includes the Meiji-Jingu Shrine, Omotesando, Tsukiji Outer Market, Kabukiza Theater, Ginza and Asakusa. Each traveler will be provided 24H Metro Subway Ticket for getting to the different sites. Hotel pickup is included and the tour will end in Asakusa for you to have your own time to explore. Your guide will pick you up at your hotel at 8am and you will then embark on your tour. Meiji-Jingu Shrine is the most popular shrine in Japan for Hatsu-mode (first Visit to a shrine or temple for the New Year) with over 3 million people visiting just in 3 days. 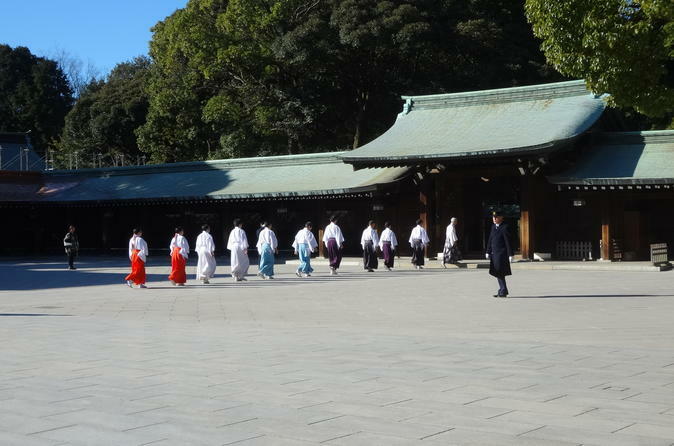 You will observe every morning convention at 9am except for Sunday in the main hall of the shrine. You will spend about an hour in this sacred atmosphere shrine. Depending on your hotel location, before or after getting fresh morning mysterious power from the forest of the shrine, you will go through Omotesando (or just get a glance from the subway) before heading to Tsukiji. Omotesando was settled as the front (Omote) approach (Sando) to the Meiji-Jingu Shrine, but now it is a sophisticated and mature area with its rows of designer boutique (Louis Vuitton, Chanel, Paul Stuart, Burberry, etc. ), artistic fashion buildings and galleries along the zelkova tree-lined street. Not so many shops will be open around 10am, so it depends on your interest whether you would like to walk through the street. Tsukiji Market has over 80 years of history and the market attracts many people in Tokyo and all over the world. Tourists are not so much welcomed by the middle-wholesalers in the Inner market and the morning lively trade would be almost finished. You will visit the Outer market, where there are various kinds of Japanese foods and kitchen items. You will spend about 30 minutes in the market. Then, you will head to Ginza by riding the subway. Ginza is one of most sophisticated shopping and eating area in Japan as well and only 10 or 15 minutes is not enough to enjoy to the fullest. Your guide will give you quick advice on what to see and visit in Ginza. From Ginza, you will walk to visit a traditional construction in front and a high-rise modern architecture behind. You will see a 5th generation Kabukiza Theater. You will learn a little about this traditional theater that has been around for 400 years. Kabukiza is directly connected to the subway Asakusa Line so you will then head to Asakusa after. Asakusa should be visited at least once by foreign visitors. It has all-time attractions even for Japanese locals. Nakamise Street is amazing. Fun-filled festivals are held all year there. There are temples and shrines there as well where you can visit. The tour will end around 12:30pm in Asakusa. You will be given specific directions on how to get back to your hotel or to other places you would like to visit by your guide.